The port is a bustling place when boats like the Star Lima (above left), operated by G2 Ocean, are docked. Shuttle chassies (top) take the containers to a pre-designated area in the shipyard. A toplift moves a container onto a tractor-trailer (above). 51 www.wrightsvillebeachmagazine.com WBM “This gives us the ability to export a lot of agriculture goods, chickens, turkeys, sweet potatoes,” Cozza says. Another public/private partner-ship is the two huge white domes constructed by Enviva to house wood pellets. Each dome can hold up to 45,000 metric tons of wood pellets, which are loaded into containers and exported to Europe, where they are replacing coal in energy production and home heating. Wood products have become the No. 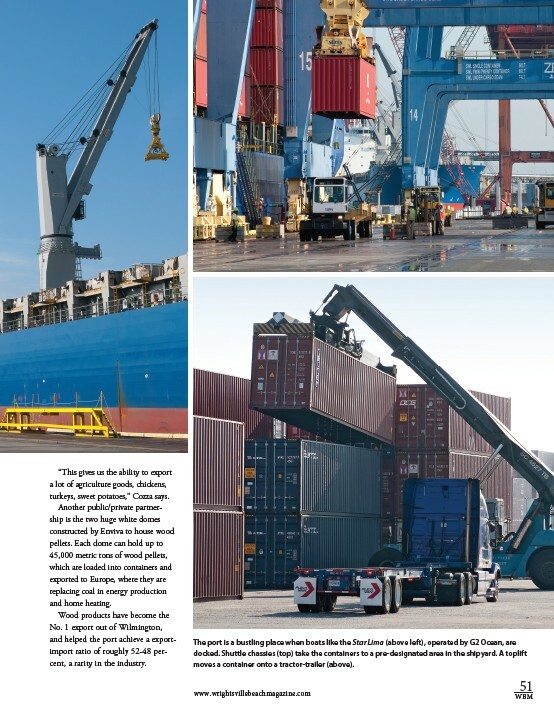 1 export out of Wilmington, and helped the port achieve a export-import ratio of roughly 52-48 per-cent, a rarity in the industry.